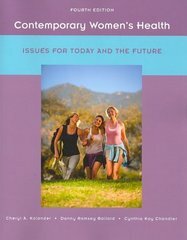 Contemporary Women's Health: Issues for Today and the Future 5 Edition Contemporary Women’s Health emphasizes health promotion and the impact of multicultural and diversity issues on women’s health. The text is written from a woman-centered perspective and offers thorough discussions on a broad range of female-centric topics including feminism and the women's health movement, global issues in women's health, and health concerns specific to diverse populations. It is appropriate for both nontraditional and traditional students in a variety of course settings including health education, general education, medical education, and women’s studies courses that emphasize a holistic approach to health.